This is a trail on the western slopes of the Catalina Mountains below Samaniego Ridge. Most of these trails in this area are used as mountain bike trails but do see some hikers, especially as you get higher up on the slopes of Samaniego Ridge. There is a maze of trails in this area many of them are not official named routes. Signage in this area is nonexistent. This trail is entirely on National Forest but access is from State Trust land and a State Trust Land Permit may be required. I was informed by the locals that hiking in the area didn’t require a permit but parking on state Trust Land probably does. The rules for State Trust Land require that you get a permit if entering Trust Land. I went on line and got a year pass for $15.00 to be on the safe side. The Majority of the trails in this area are on National Forest but the Trail Heads are on Trust Land. Access to the Baby Jesus Trail is from the Golder Ranch Road Trail Head. 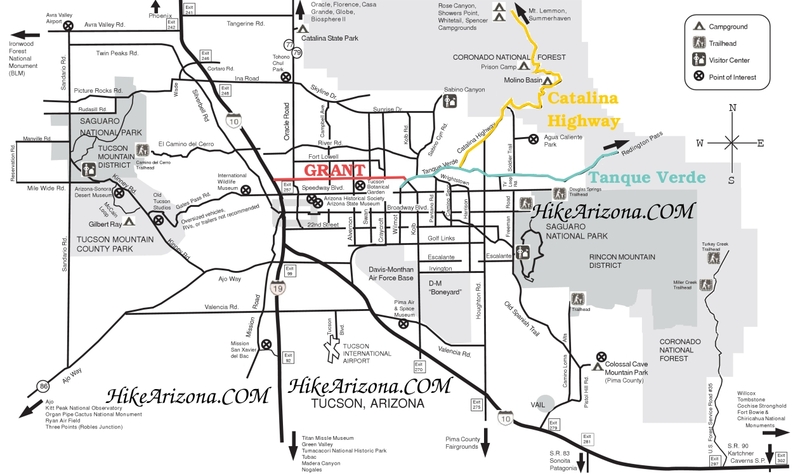 This trail starts on State Trust Land at the same location as the Middle Gate Trail and just like the Middle Gate quickly enters National Forest after crossing Sutherland Wash. In the first two miles the trail climbs 700 feet but the first half mile is a fairly gradual climb. Take time to check out the rather fine collection of saguaros along this section, while not the largest I have seen it is impressive and probably has more large healthy saguaros that I have seen in one small area. After the Saguaro display the trail starts to climb and closer views to the south of Baby Jesus Ridge come into view. Samaniego Ridge and Peak are to the east. At 2.2 miles in is the junction with what I am calling the Baby Jesus Upper Trail, Could not find an official name for this trail so I named it. This trail heads back to the north staying above and east of the baby Jesus Trail and ending on the Cherry Tank Trail. The Baby Jesus crests out at 2.4 miles and for the next 1.6 makes only small elevation changes as it crosses streams that are coming down off of Samaniego Ridge. Views to the south are of Cargodera Canyon and the Sutherland Ridge. At 2.8 miles a cement trough at wooden trough spring (don’t ask) is alongside the trail. This was October and there was water in it. The trail continues on down a ridge and crosses a major wash and then out of the wash to the Sutherland Trail (4WD Road). This trail appears to be more popular with hikers than bikers, probably due to the steepness of the first half. This trail starts out with views of Samaniego Peak and Baby Jesus Ridge and transitions to views of Cargodera Canyon and Sutherland Ridge. This trail is easy to follow with one exception just south of Wooden Trough Spring. Stay on the ridge heading south and don’t get suckered into following a trail that heads west down from the ridge. I had a GPS route and I made the mistake. Lesson learned check the GPS more often.